A module to show adverts in your module positions. - Select Extensions => Module Manager => Jom Classifieds- Adverts. Now you should see the following form. Select category Select category from which the adverts should be displayed. Include sub-categories in result Select whether the adverts should be displayed only from the selected category or should add the results from its child categories too. Filter by Filter by premium adverts or free adverts. Order by Order in which the adverts should be displayed. “A to Z” sorts the adverts in alphabetical order. “Latest” sorts the adverts which were posted recently. “Price (Low to High)” sorts the adverts by its price. “Price (High to Low)” sorts the adverts by its price. “Date Added” sorts the adverts by its posted date. “Most popular” sorts the adverts which have maximum views. “Random” sorts the adverts any order. “Recently viewed” sorts the advert which was viewed recently. Follow categories Select whether the categories should be followed or not. Title characters limit Number of characters to be displayed in the title. Description characters limit Number of characters to be displayed in the description. Show image Show/ Hide adverts image in module. 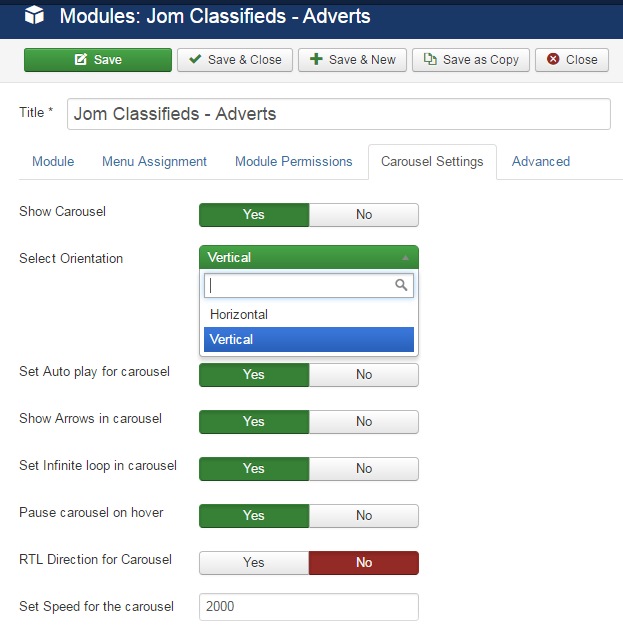 Show category name Jom Classifieds have support for Joomla's native Module styling feature that could be used to design the front-end of its Modules. Check this link to know more about this feature. Show location name Select whether to show location or not. Show created date Show/ Hide adverts created date in module. Show views count Show/ Hide adverts views count in module. Show user name Show/ Hide advertisers name in module. Maximum adverts to display Enter maximum no. of adverts to be displayed in adverts module. Number of column In number of columns adverts to be displayed. Caching Select whether to cache the content of this module. This is a non-configurable option and always to set to "Never"..
Show Carousel Enable / Disable the Carousel. Select Orientation Choose either Vertical/Horizontal to change the Orientation of adverts module. Set Autoplay for carousel Set Yes / No to whether carousel should autoplay or not. Show Arrows in carousel Set Yes/ No to display the arrows (previous / next arrows) or not. Set Infinite loop in carousel Set Yes/ No, whether to scroll infinitely or not. Pause carousel on hover Set Yes/ No, to pause the carousel on hover or not. RTL Direction for Carousel Set Yes / No, to change the slider's direction from right to left. Set Speed for the carousel Set animation speed for carousel.